Bombardier Recreational Products (BRP), the private company that owns the Evinrude brand, kicked off a year-long celebration of Evinrude’s 100th anniversary on February 14, 2008 at the Miami Boat Show. Always on the cutting edge of boating innovation, Evinrude moves into the future with its line of E-Tec outboard motors, the most environmentally friendly outboard motor in the world. Evinrude also has a popular line of boat motor oil. “By letting people throw away the oars, Evinrude outboard engines have introduced scores of people to the joys of boating and turned these people into lifelong boating enthusiasts,” Roch Lambert, vice president and general manager of the outboard motor division at BRP, said at the time. “Indeed, in its proud history, Evinrude has sold more engines worldwide than any other outboard manufacturer. People know that buying an Evinrude means buying a trusted brand name that delivers everything they want in an outboard engine,” Mr. Lambert continued. 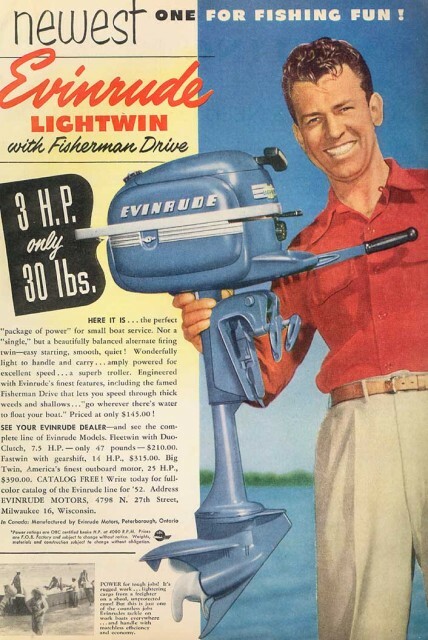 The outboard motor was invented over 100 years ago — the inventor, Ole Evinrude, died 68 years ago. Ole Evinrude was born in Norway in 1877. His family moved to the U.S. when he was a small boy, settling in Wisconsin. He grew up working with his hands and spent his teens taking jobs at factories until he founded his own motor shop around the turn of the century. The Story that sparked the Idea! In 1906, Evinrude was picnicking on a small island with Bess Cary, his future wife. Bess mentioned that she’d like some ice cream and Ole volunteered to go get it — even though it meant rowing quite some distance to another island. By the time Ole returned with the gallon of ice cream, it had melted away. This event inspired Evinrude to create a lightweight, detachable motor that could power small boats. He made his first tests in 1907, started a new company in 1909 and obtained a patent in 1911. Soon the Evinrude Outboard Motor Company had hundreds of employees. Ole led the technical team and Bess was in charge of advertising and promotion — with the company’s motto: “Don’t row! Throw the oars away! Use an Evinrude motor”. He later started his own brand of Evinrude Oil … but that’s another story! The Evinrudes retired early, but they got back into the small motor business in the 1920s. They continued to improve and sell their outboard motors, even during the lean years of the Depression. Bess died in 1933 and Ole died the next year, at the age of 57, on July 12, 1934. The year he died, his company created the Lawn-Boy brand of lawnmowers, which still exists, as does the Evinrude brand of outboard motors — although both brands are now owned by different companies. The budding love of a woman and her love for ice cream sparked an industry that today is worth billions of dollars!